First post of 2012! This post has been in my mind for a few days and I’m finally putting it on paper… well… you know what I mean. So you know I did my big chop on 7.22.11. 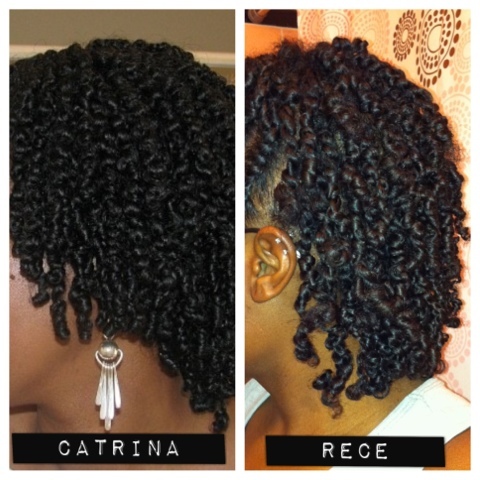 A major inspiration for my big chop was Forever Curly Catrina (You need to see her Fotki!). When I saw her hair, I thought to myself that we had similar hair textures. I fell in love with her mini twists and decided that I was ready for the big chop and I would mini twist my hair. FAIL! FAIL! FAIL! In 2011, I learned that my hair texture is like none other. Everyone has a unique hair texture that responds differently to different things. I also learned that whatever style you see someone else rocking, it will never look exactly the same on you. It’s best to just start off with a variation of it to save yourself the disappointment. About two posts ago, I showed you my mini twists, which I absolutely love. A few days later I stumbled upon this pic of Forever Curly Catrina and realized that I randomly achieved the style that I was dying for when I first cut my hair. Small two strand twists that curl at the ends. SUCCESS! I redid my mini twists tonight. This time, I timed it and it took me about 2.5 hrs to twist my whole head. Never again… for real this time! Come on 2.5 hours compared to my 8, is nothing. Lol. I’m actually loving my twists too. Happy New Year. LOL!! Exactly Marsha, because Rece … I don’t know if you can call those mini twists … they’re more like medi-twists! But, 2.5 hours to leave in for a week or less is a lot of time! That’s why I don’t do them that often! How did your wash day go?!? You were worried, but I didn’t think that it would be that bad. Btw, yeah, your twists look almost identical to Katrina! They look great. I love her protective cornrow styles. She has GORGEOUS hair too. I saw her hair idol story on CurlyNikki last year and was drooling! LOL! Her hair looks so healthy and thick! They’re pretty small. They just look bigger because they curl up also. A lot of people don’t even realize my hair is twisted. They think it’s just curled. I must admit though that my twists get bigger as I twist. Probably because I become impatient and just want to finish. Lol. I completely forgot about my wash day post. It’s coming. LOL. Your hair is longer than mine. I already know that when my hair is long, I’ll never do them. I don’t blame you Shelli! 8 hours though?! Sheesh! Lord, I’m sticking with pin curled twists. Going to do them today and hopefully take my time. My twists still don’t stay so if I wear them loose, they will unravel by day 2. just the nature of my hair. You’re so right. No two heads are the same. Anyway, last day before going back to the day job. *blah! Can’t wait to see pics! Have you posted pics of it before? I might have missed it. I thought my hair would unravel too (especially when I washed it while it was twisted), but I think the fact that the ends curl so much prevents them from unraveling. Happy New Year to you too! I’m actually off for another week. Yahoooo! Off for another week. LUCKY.